Not meeting in January 2019. See you in February! Bring Femme of color friends! 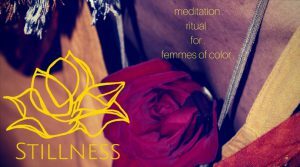 Stillness is a bi-monthly spiritual practice circle for the spectrum of trans, qpoc, womxn, cis women and gender non-conforming femmes of color. The 2nd Monday of the month focuses on cultivating awareness around habitual thoughts and feelings by contemplating the wisdom of contemporary authors of color and Buddhist texts on the nature of mind. After contemplation we delve into the practice of sitting and walking meditation. On the 4th Monday we protect, release, manifest, surrender, evoke and heal through ritual. Rituals vary from writing workshops, movement meditation, crafting spiritual talismans, collective tarot readings and connecting with ancestors. Stillness grows a council of femme practitioners of color aware of their power, and capable of focusing energy for personal and collective transformation. SOJOURNER WRIGHT has been practicing Shamatha (peaceful abiding) meditation in 2004 when she transferred to a Naropa University a Buddhist inspired school. In winter of 2012 she spent 3 months at Amaravati Monastery in London practicing in the Theravadan Buddhist tradition, Vipassana (insight meditation). Apart from her daily practice, Sojourner frequently attends meditation retreats to continue to reveal the empty nature of mind.